The general theme for the sequence is quantitative analysis which allows us to thoroughly discuss many generalizable topics surrounding laboratory science such as measurement uncertainty, propagation of uncertainty, and statistical handling of uncertainty. These ideas apply to any field that uses empirical data which helps make our laboratory curriculum more relevant to the wide range of majors taking the General Chemistry courses. Prior to the experiments discussed here, the students complete laboratory exercises in calibrating and using laboratory equipment such as the electronic balance, volumetric pipets and burets, the proper use of a volumetric flask to prepare solutions, and basic titration procedures including standardizing a sodium hydroxide solution and its subsequent use to analyze household vinegar (see Figure 1). For each piece of equipment used the students are instructed not only in the fundamentals of using the equipment, but also the basic features, the measurement tolerances, and the rationale behind any specific laboratory protocols for using the equipment such as weighing by difference, pretreatment of volumetric pipets and burets, and the stepwise with swirling procedure for filling volumetric flasks. After completing these exercises, the students are tasked with analyzing a sulfuric acid solution where the concentration of the sulfuric acid solution is too high to be conveniently analyzed with the standardized sodium hydroxide solution available to them. To complete the task, students must first quantitatively dilute the stock sulfuric acid solution which illustrates a practical use for the quantitative transfer and solution preparation techniques from previous exercises. The students then quantitatively transfer aliquots of the diluted acid solution to Erlenmeyer flasks and titrate the diluted acid solutions with the sodium hydroxide solutions to a phenolphthalein (PHTH) endpoint. A flowchart illustrating the procedure is shown in Figure 2. After the diluted acid solution concentration has been determined, the students can then calculate the stock acid concentration using the dilution ratio from the first stage in the procedure. This experiment serves as an effective capstone exercise for the first-semester laboratory to reinforce the quantitative procedures from previous exercises while also introducing non-1:1 stoichiometry in an acid-base titration, the role of dilutions in chemical analysis, and the idea of back-calculation to determine the stock concentration. At the beginning of the second-semester, the quantitative analysis procedures are revisited in a second capstone exercise. The students first quantitatively prepare a stock solution of KHP using the electronic balance and a volumetric flask (Figure 3). 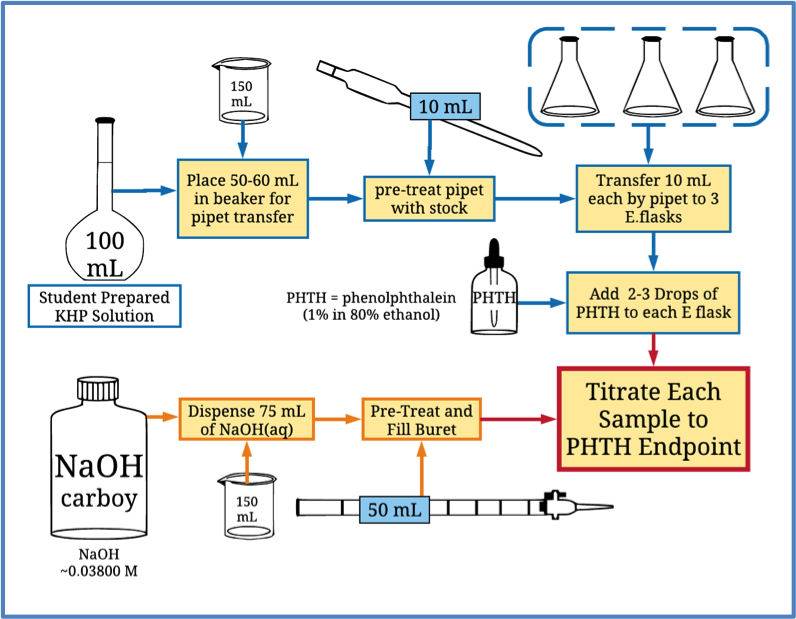 The students then titrate the stock KHP solution using a standardized sodium hydroxide solution to a PHTH endpoint that requires them to refresh their skills using the volumetric pipet and buret as well as requiring them to recall their knowledge regarding titration procedures and acid-base stoichiometry (Figure 4). The students gauge their success for this exercise by determining the %Relative Average Deviation value (%RAD) for the titration activity to quantify the level of precision of their titration process and the % Difference value (%Diff) between the nominal stock concentration calculated from the preparation stage and the experimental concentration from the titration stage as a means to measure their success for the entire procedure. We use tolerances of ≤1%RAD to indicate a “good” level for student precision in the titrations and ≤1%Diff agreement between the two concentration values to show a successful overall procedure. 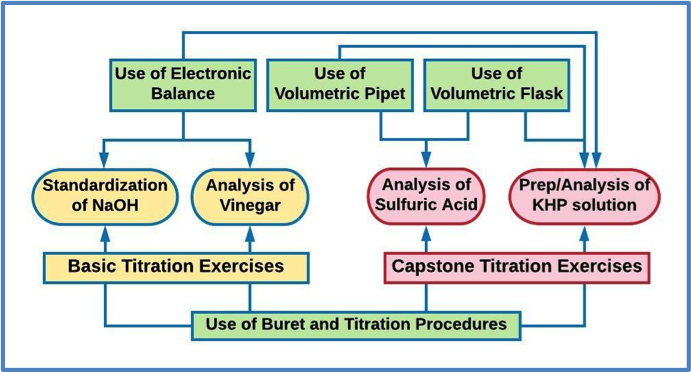 Taken together, the early exercises with individual pieces of equipment, the two basic titration activities, and the two capstone titration exercises have been effective in helping students gain the necessary familiarity with quantitative laboratory procedures that they can maximally benefit from later experiments (see Figure 5). The constant revisiting of the core techniques allows students ample time to learn the fundamentals of each technique as well as begin to view them modularly since different core skills may be employed for nominally similar experiments. It has been our department’s experience that students don’t have the needed “muscle memory” to be able to think much during the titration procedures until the sulfuric acid experiment. Until that point, they are largely following the written procedures by rote. This past Fall semester, I had some fun “freeing their minds” by asking my students to put away their lab manual for the sulfuric acid experiment and complete the activity using their experience from previous activities and any knowledge gained while completing an online pre-experiment assignment. This is announced during the pre-experiment discussion so that students will know to pay close attention. During the discussion, the full procedure is presented in detail and the presentation ends with an overview of what was to be accomplished that day (Figure 6). 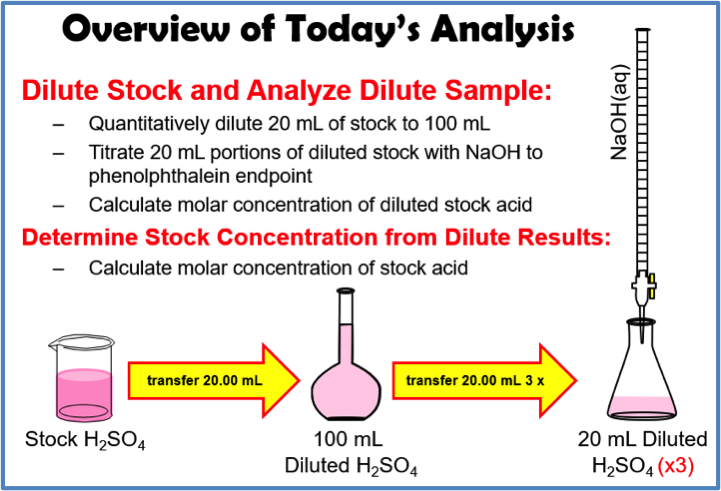 Our labs are outfitted with computer monitors and this slide is left on the screens as a quick reference until all students have begun titrating their dilute acid samples. After only a short period of discomfort in being untethered from the stepwise instructions in the manual, all students in three sections of laboratory were able to complete the activity successfully. Between the Fall and Spring semesters, our institution has a 5 week break to allow for Winter term online courses and the students forget much. We use the second capstone activity using KHP to refresh the student’s quantitative analysis skills. Students are allowed to use the procedure in the lab manual for this activity since most of them require that crutch. The KHP activity also serves as a quick “crash course” in the fundamentals of quantitative analysis for students who have taken the first semester laboratory some time ago or at another institution. The remainder of the second-semester laboratory course follows a more traditional approach in that it includes experiments designed to support current topics in the lecture course. We do include two consumer-oriented analyses for purposes of timing certain experiments to correlate with the lecture schedule and quantitative analysis procedures are also featured in late-semester equilibrium studies. (Figure 7). Having already developed substantial skill in quantitative procedures and some level of confidence, the students are able to better focus on the chemical theory in these later experiments since the core procedures have become somewhat trivial to them at that point. Admittedly, some students become bored with titration by the end of two semesters. Some of this disinterest can be alleviated by stressing the versatility of the technique and including examples of how titration is used in various fields. Some students do notice how “nice” it is to not have to constantly learn new procedures. The lack of a need to discuss laboratory techniques in the later experiments frees up valuable pre-experiment discussion time to better explore side-topics or to more firmly cement the connection between the laboratory activity and the current lecture material. The inclusion of the consumer-oriented analyses also helps to maintain student interest throughout the sequence. Our faculty are generally pleased with the results. At the start of the second semester, students are much more capable and confident in the laboratory. By the end of the second semester, most students become quite efficient and can complete a basic, three-sample titration procedure in approximately one hour from set-up to clean up. Students seem better able to actively process while working on the capstone and later activities often asking perceptive questions about the experiment rather than the typical, low-level “what do I do next?” type questions of disengaged students. While not expressly designed for chemistry majors, the students in our department who go on to take the upper-level Analytical and Physical Chemistry courses more easily adapt to the stringent quantitative procedures required in those courses since it only requires that they fine-tune skills developed during the first-year laboratory courses. 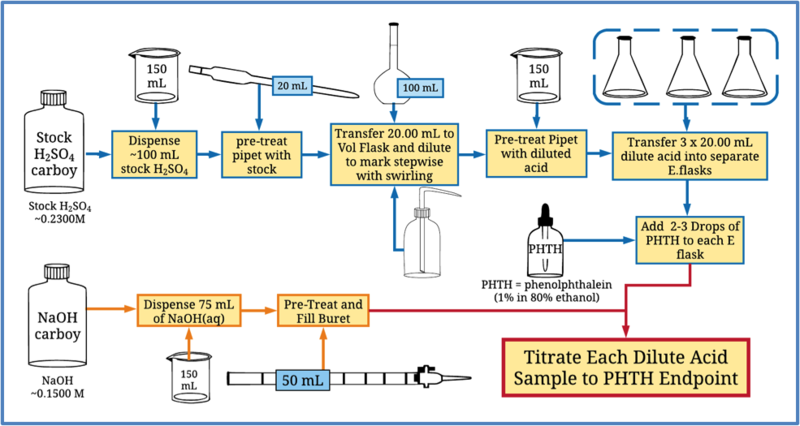 Overall, the two capstone exercises involving titrations are effective activities to round out a sequence focusing on quantitative procedures. They also serve as a springboard to enhance more chemical theory rich activities by diminishing the need to reteach laboratory techniques. Even in a traditional laboratory approach where the quantitative techniques are presented as part of a titration experiment rather than treated separately beforehand, either of the capstone exercises could be used as a follow-up activity to review skills or as a laboratory practical exercise for student and/or curriculum assessment. The author would like to thank Ms. Allison Tarvin for her blog post, Do you have a favorite acid-base titration lab?, the inspiration to share the story of our laboratory curriculum redesign and ChemEd X Editor, Deanna Cullen, for many helpful communications during the drafting of this document. The images were made using an online program called Lucidchart (www.lucidchart.com). Thank you for sharing your ideas on titration. The graphic are awesome! Great visuals to use with students. Glad you like the procedure flowcharts!. I made them and the other images in the article in a free online program called Lucidchart (www.lucidchart.com). It's great for making flowcharts,Venn diagrams, decision trees, etc. You can share and collaborate in real-time or asynchronously. They offer free basic accounts for educators and students (with .edu email addresses). I had been making similar diagrams in PowerPoint for pre-experiment discussion and those are still useful because they are easier to animate, but it's much easier to get that "polished look" with Lucidchart. I've been working on integrating the Lucidchart flowcharts into my laboratory teaching by having the students work in small groups to prepare flowcharts for the procedures like the ones shown in the article as part of their pre-experimental work. I'm hoping to write up something on this soon. It's been quite interesting to see how different student groups read and conceptualize laboratory procedures from having them construct these visual guides.